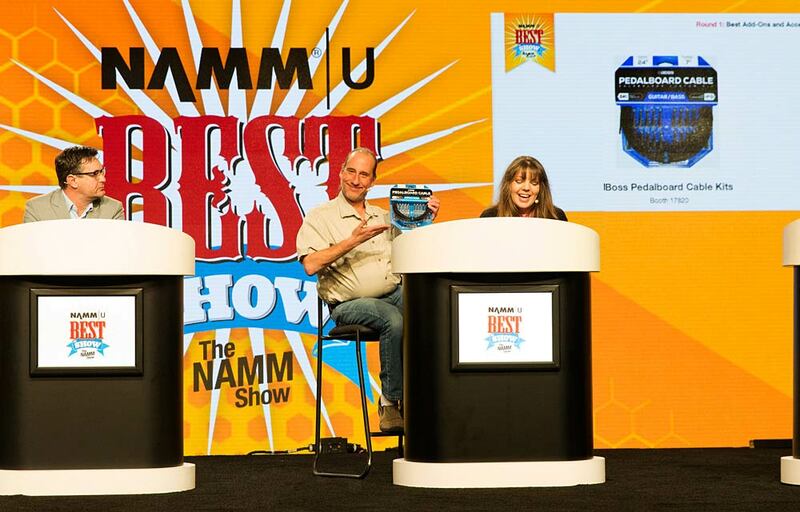 Rand and Cindy Cook honoring the BOSS Pedalboard Cable Kit during the 2018 NAMM Best in Show Awards. BOSS’s do-it-yourself pedalboard cable kits are designed to save pedalboard space without sacrificing tone. Players can easily customize their boards by tightening a single ground screw on each connector, with no cable stripping required. Compact bi-directional ¼-inch plugs are engineered to allow straight- or right-angle connections, so pedals can be as close as 1 cm apart. The low-capacitance, studio-grade cable features oxygen-free copper and braided shielding for quiet operation with lasting durability. The extra-pliable cable allows for ultra clean cable management and a tidier looking pedal board. Premium 24K gold-plated contacts ensure the highest quality, most precise sound reproduction available. Individual kits are available with a variety of cable lengths and connectors, including 2 ft. ($19.99), 6 ft. ($49.99), 12 ft. ($89.99), and 24 ft. ($149.99). A 2.5mm screwdriver tool is also included with the 6 ft., 12 ft., and 24 ft. kits. Packages of 100 bulk connectors ($500.00) and 150-foot cable spools ($300.00) are also available.